My house has been a sick house the last couple weeks. We are all finally on the mend (thank goodness) but it has definitely not been fun. Two weekends ago, my daughter came down with a bad cough and a 103.5 fever. My husband, who got his spleen removed earlier this year, was told that when he gets sick, he might get it worse than he typically would have had he still had a spleen. He was also told that if he came down with any fever over 100.4 he would have to call the ER to make sure he didn’t need to come in. Being the paranoid person that I am, I sent him away for the weekend with my little boy so that hopefully my little girl’s sickness would ride itself out and I could get my house sanitized for their return. Well, New Years Eve came and my daughter came down with pink eye, so my husband, who had just drove into town went to his aunts for 24 hours while my daughter started her antibiotics. These pancakes are so delicious! 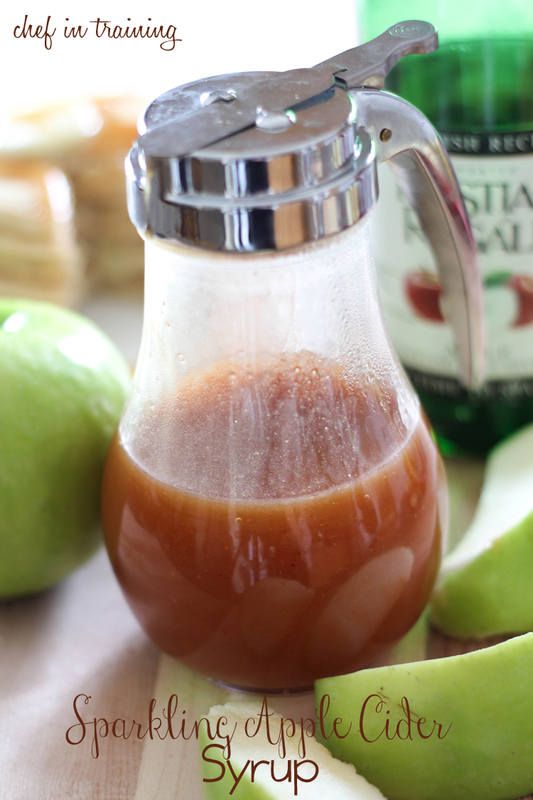 With fresh apples inside and sparkling cider, they are sure to be a hit in your home! In a large bowl, combine flour baking powder, salt, sugar and cinnamon. Stir to evenly combine. Add milk, sparkling apple cider and egg and whisk until well combined. Evenly fold in diced apple. Cook on low-medium heat. Brown on both sides and cook through. Serve hot. TO MAKE SYRUP: In a medium saucepan, combine sugar, cornstarch, cinnamon, sparkling apple cider, lemon juice and butter. Stir constantly over medium heat until well combined and syrup thickens. Serve hot. Looks delishous! I wish I had this for breakfast right now. I will have to give these a try! Thanks for the recipe! Oh Nikki. These look and sound sooo good! Thanks for the recipe! Sounds like the perfect recipe for a sick household! So delicious and comforting! I can't wait to try these-they sound amazing! Do you think they would work with all purpose gluten free flour and plain apple cider? Nikki I had a feeling something was up with you and I am so sorry to hear it's been chaos for you! These look amazing and the sparkling cider SYRUP is where it's at for me! we have been sick as well:( hopefully you're on the mend. These pancakes look absolutely delicious - we LOVE our breakfast here! Goodness--I'm glad to hear that the household is at least on the track back to recovery! My entire extended family visited right after my parents came back sick from vacation...I had to vacate my room and sleep in theirs, but they made me sleep in their (not-generous) closet so I could keep the germs out. Wonderful parents I have. These pancakes might be a good reward for my suffering though! I'm so sorry your family was sick and you had to cancel your New Year's plans! 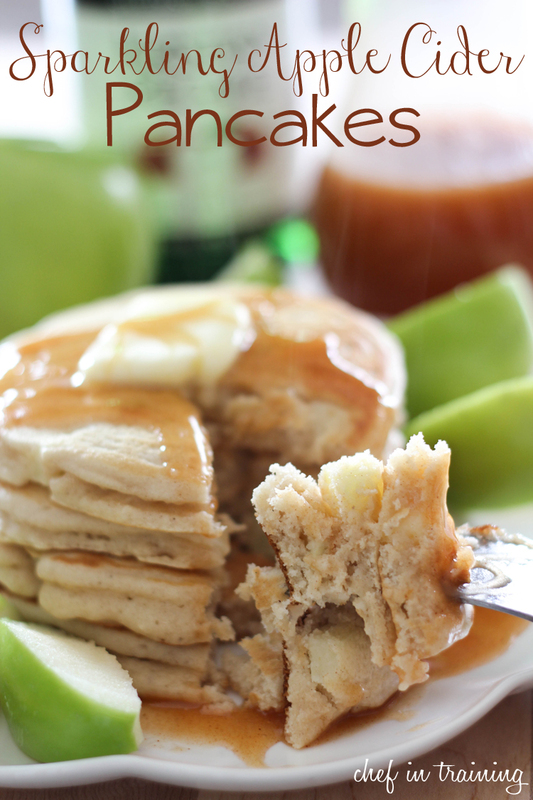 These pancakes sound fantastic though and what a great idea to use up leftover sparkling cider! Looks yummy. Will make some for breakfast on the Easter weekend.. I am looking for the Sparkling Apple Cider Pancake recipe. Is there anyway you can repost the recipe? I have made it in the past and loved it. The homemade syrup makes it so delicious. For some reason all I am seeing on your site is the pictures but not the recipe.